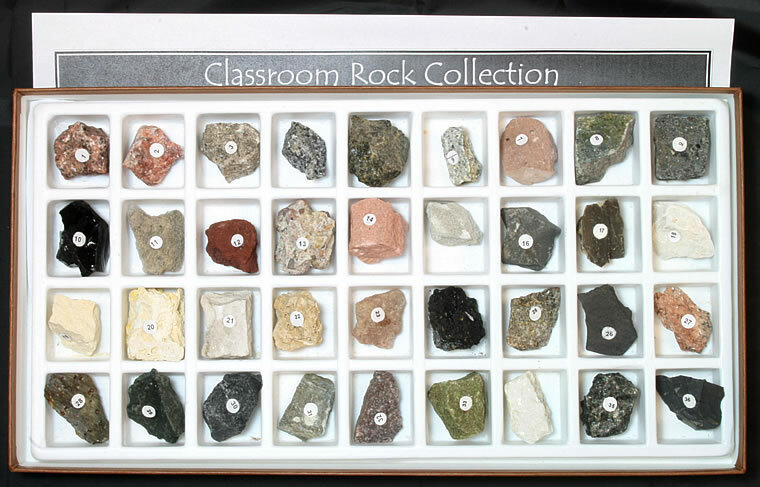 A great collection to begin your study of sedimentary, metamorphic and igneous rocks. 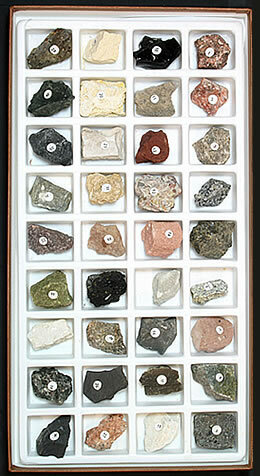 Fifteen representative specimens of the rock types most often included in geology textbooks. Each specimen measures about one inch in diameter. Included are: obsidian, granite, basalt, pumice, rhyolite, shale, tufa, sandstone, limestone, conglomerate, slate, marble, quartzite, gneiss and schist. 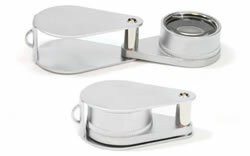 Small plastic hand lens included. Packaged in an attractive specimen box with a plastic tray to keep your collection organized. Click on the image for a larger, more detailed photo. 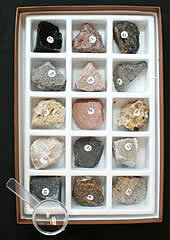 A comprehensive collection of 36 different sedimentary, metamorphic and igneous rocks. Includes the specimens most often described in geology textbooks. Larger specimens than in the Rock Study Kit described above - they measure between 1 and 1.5 inches in diameter. Included are: granite, syenite, diorite, gabbro, porphyry, felsite, andesite, basalt, obsidian, pumice, scoria, conglomerate, sandstone, shale, limestone, gypsum, tufa, rock salt, coal, gneiss, schist, slate, soapstone, quartzite, marble, amphibolite, hornfels and more. Packaged in an attractive specimen box with a plastic tray to keep your collection organized. Start becoming an expert in rock identification. Click on the image for a larger, more detailed photo.